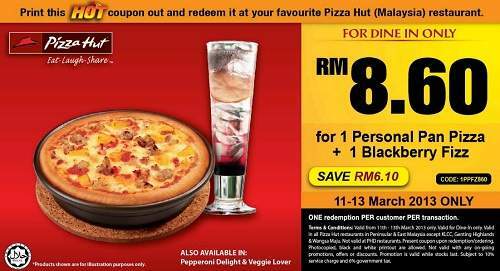 Pizza Hut HOT Copuon : Get a Personal Pan Pizza + Blackberry Fizz at RM8.60 only! Location validity : All Pizza Hut restaurants in Peninsular & East Malaysia except KLCC, Genting Highlands & Wangsa Maju. Not valid at PHD restaurants. Also available in Pepperoni Delight & Veggie Lover. Valid from 11 - 13 March 2013 only. Valid in all Pizza Hut restaurants in Peninsular & East Malaysia except KLCC, Genting Highlands & Wangsa Maju. Not valid at PHD restaurants. SUbject to 10% service charge and 6% government tax.